Connecting coastal communities with dugout canoes. The air will be fragrant with the smell of smoking salmon and the shores lined with thousands of visitors who’ve come to witness the arrival of the Tribal Journeys’ canoes landing on the beaches of Discovery Passage. As the first of the canoes glide towards shore, the We Wai Kai and Wei Wai Kum Nations will stand together to welcome canoe families into their territories. This six-day event celebrates the dugout canoe, the traditional mode of transportation for the First Peoples of the coastal corridor in pre-contact times. Fashioned from a single large cedar tree, the canoes were capable of successfully navigating the rugged coastlines of Alaska, British Columbia, Washington, Oregon, and California. Despite their importance, their use has all but disappeared with changing technologies and resources, and years of culturally restrictive legislation. The first canoe journey of this century was undertaken by the Glwa canoe family of the Heiltsuk Nation in Bella Bella, who paddled 500km from their community to Expo ‘86 in Vancouver. Three years later, the First Peoples of Washington State organized the Paddle to Seattle to celebrate the recognition of aboriginal rights and titles. While there, the Glwa canoe family invited those gathered to join them in their territory in 1993 and Tribal Journeys began. During Tribal Journeys, canoe families paddle from their coastal communities to other coastal communities towards the host nation. Along the way, tribes share their stories, their songs, and their dances, strengthening their connection to each other, to the land, and to their cultural heritage. Depending on distance, some will travel more than five weeks to reach their destination. On August 5, canoes will reach the shores of Cape Mudge, and on August 7, canoes will reach the shores of Campbell River. Public community feasts will be held to celebrate the arrival of the canoes, as well as artisans providing unique gifts and keepsakes, and food vendors offering both traditional and non-traditional fare. Shuttle services will be ready to transport visitors from the BC Ferries terminal in Quathiaski Cove to the landing and protocol sites on Quadra Island. Be sure to plan extra time to visit the Nuyumbalees Cultural Centre in the Village of Cape Mudge. 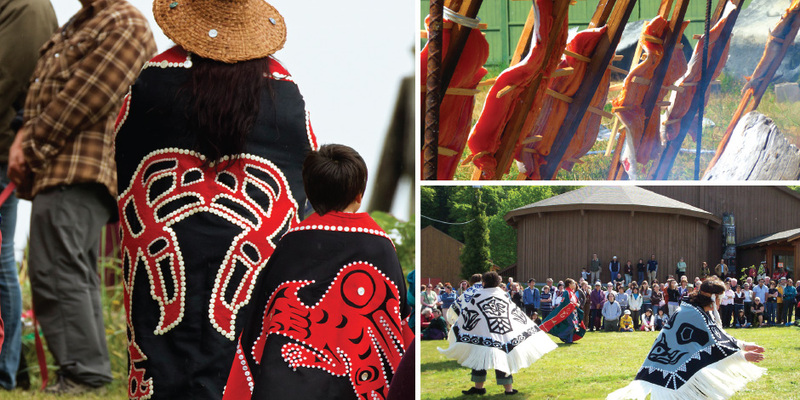 Nuyumbalees is home to the Sacred Potlatch Collection repatriated from the Federal Government, and the oldest facility of its kind in Canada. Eight totem poles surround the centre, and the Native Garden, situated on the shores of Discovery Passage, offers spectacular views. Have your camera ready to capture the orca and humpback whales often seen from shore. BC Ferries provides daily year-round service from Vancouver Island, and the return trip from Quadra Island is a great opportunity to view Campbell River from the water. The terminal at Robert Ostler Park features First Nations welcome poles and art. Beautiful hand carved totems dot scenic walkways and mark the gateway to shopping and attractions across the City of Campbell River. If you’re looking for a special souvenir, visit the Henderson Family Carving Shed where you will find Master Carver Bill Henderson creating beautiful pieces from cedar. Or, if you prefer, stop in at the House of Treasures where many local artisans showcase their work. Regardless of how you choose to spend your time in our territory, we welcome you. Enjoy the beauty of our lands and the authentic offerings of our people.